Exploration contractor PerfoChile is known for its work with reverse circulation and diamond core drilling. That reputation has just been given three extra plus points with Atlas Copco’s RD10+. Chile produces more than one third of the world’s copper and also has an abundance of gold, silver and iron and exploration drilling is continuously under way to find more hidden treasures. Among the many contractors who provid­e these drilling services to the nation’s mining companies is PerfoChile, a contractor with a widespread reputation for reverse circulation (RC) and diamond core drilling as well as blasthole drilling. Most of the company’s contracting work is done in northern Chile and the company calculates that it has drilled more than seven million meters since it was founded some 30 years ago. A more recent milestone is that the compan­y has also commissioned a new Atlas Copco RD10+ RC drill rig – the fourth such rig in its equipment fleet. This large-hole rig is a typical hydraulic, top-head drive drill that produces 445 kN of pullback force and 13 560 Nm) of torque. By way of contrast, the majority of exploration contractors in Chile are focused on core drilling, which is a slower process than RC drilling, and, PerfoChile says, less cost effective. PerfoChile was founded in 1984 by Osvaldo Carmona Vergara, a former mine superintendent, and today, besides a modern drilling fleet, the company also has service workshops in Santiago, Antofagasta and Pozo Almonte. According to Carmona Morales, the RD10+ has at least 90 percent availability and typically performs at a high level. “We prepare the rig before the job, and if something were to happen to the rig we’d have to put all of our resources into that rig to get it running again,” he says. With a three-man crew consisting of one driller and two drill helpers, PerfoChile works three shifts per location, including a relief shift. Typically each shift includes time for breaks, set-up and maintenance. Most jobs consist of eight to 10 holes, usually drilling a total of 3 000 m per month. Carmona Morales said they even hit a total of 5 000 m in one month for a client who needed 10 holes drilled to a depth of approximately 500 m.
The holes are typically 146 mm in diameter and about 400 m deep, using a down-the-hole hammer. The great majority of Chile’s mining takes place in the Norte Grande region, bordering Peru to the north, and the Atacama Desert. Working in rugged, remote locations requires PerfoChile to set up camp for each job. And the compact design of the RD10+ is ideal for working in such remote locations. With inevitable travel between jobs, the ability to go anywhere at any time without a great deal of support along the way is crucial. It takes approximately on average three truck loads to move from site to site. “We use one compressor and booster, a truck for rods, and another truck for fuel. We use trailers for a camp, too,” says Carmona Morales. 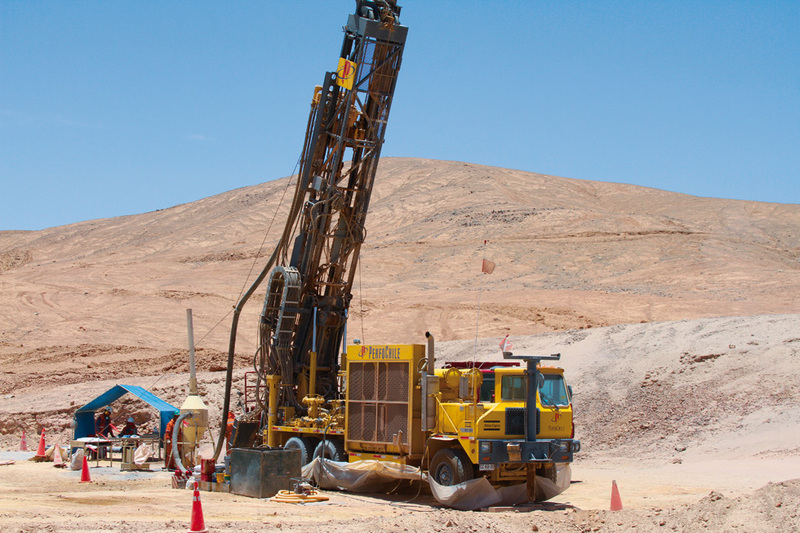 PerfoChile drillers have become expert RD10+ operators – both inside and outside the country. Some of them helped with the setup and training of an RD10+ that was shipped to a customer in Brazil. This shows the strong relationship between PerfoChile and Atlas Copco. Eguillor says: “There’s a lot of continuity, confidence, and loyalty between what was Ingersoll Rand and what is now Atlas Copco.” It’s this confidence that ensures they will most likely continue as partners well into the future.